For the first time ever, a movie has been made that entertains and educated the dog owner on how to train his best friend. 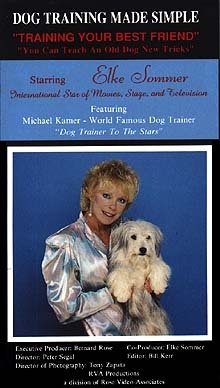 Internationally known star of movies, stage, and television, Elke Sommer, stars as our hoast in the program. Her great love of animals makes her a great natural choice to make this video. Elke took a dog named "Alfie", an untrained 6 month old pet she picked out of the East Los Angeles Animal Shelter, and so wanted to see this project made, that she volunteered her time to co-produce this video. The "Kamer Praise Technique" is not only for training untrained dogs, but also for owners of partially-trained dogs that are a niusance. Michael Kamer, the world famous Dog Trainer to the Stars, brings to the screen his technique. Michael takes Elke through the steps of training her dog, and the experience is fun-loving and entertaining. Edward Cubrda, Executive Director of the S.P.C.A., and his staff, after viewing the video, stated in his commendation that this video is the most entertaining and educational video that he and his staff have ever seen, and believes it will save the lives of hundreds of thousands of dogs per year. For more information, please also see the book "Successful Dog Training" that gives step by step proven training techniques that are invaluable tools in acquiring, training and caring for your dog.